Barra was interviewed on NBC in the United States. DETROIT (Reuters) -- General Motors CEO Mary Barra said further vehicle recalls remain a possibility as GM continues to deal with a number of safety issues that have led to the recall of 20 million cars. Barra's comments in an interview with U.S. broadcaster NBC came a day after GM issued its latest in a string of recalls, this one for 33,000 Chevrolet Cruze sedans with potentially defective airbags made by troubled Japanese supplier Takata Corp. Asked if the company would issue more recalls, Barra said, "It's possible." "We're going to continue to look at the data that we get, and we're going to take the action that we need," she said. "If we find an issue, we're going to deal with it." 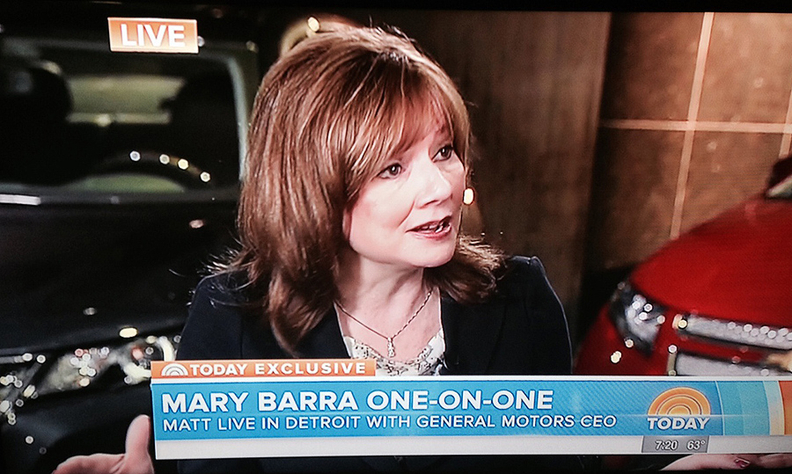 "We want every single person who either lost a loved one or has a serious physical injury to be a part of that program," Barra told NBC during the interview at GM headquarters in Detroit. Asked if GM had fired everyone it was going to fire in connection to the Cobalt recall over the defective switches, Barra said, "Yes, I believe we have." "We've addressed the issue," she added.